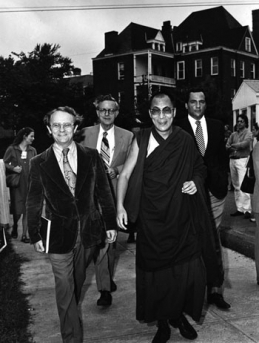 Photo by Edwin Roseberry November, 1979 The Dalai Lama toured the UVA Grounds with Dr. Ian Stevenson, (back left) and Prof. Jeffrey Hopkins (front left). Prof. Hopkins was the Dalai Lama’s official interpreter from 1976 to 1996. The Division of Perceptual Studies (DOPS) is a unit of the Psychiatry and Neurobehavorial Sciences of the University of Virginia’s Health System. It was founded in 1967, when Dr. Ian Stevenson resigned as Chairman of the Department of Psychiatry to become Director of the Division and Chester F. Carlson Professor of Psychiatry, positions he served in for the next 35 years. Early in 2002, Dr. Bruce Greyson, who has been a faculty member at DOPS since 1995, formerly the long-time editor of the Journal of Near-Death Studies, took over as director and Carlson Professor of Psychiatry. This allowed Dr. Stevenson to devote more time to writing books and articles about his research into cases of the reincarnation type. In September of 2014, Dr. Bruce Greyson retired from the directorship and Dr. Jim Tucker, Bonner-Lowry Associate Professor of Psychiatry and Neurobehavioral Sciences, became the Director of the Division of Perceptual Studies. Dr. Tucker has authored two books thus far on his research into the phenomena of children who claim to remember previous lives. His most recent book, Return to Life: Extraordinary cases of Children Who Remember Past Lives was published in 2013, and his first book Life Before Life: A Scientific Investigation of Children’s Memories of Previous Lives was published in 2005. The Division’s main purpose, and the raison d’être for its foundation, is the scientific empirical investigation of phenomena that suggest that currently accepted scientific assumptions and theories about the nature of mind and consciousness, and relationships to physical matter, may be incomplete. Examples of such phenomena, sometimes called paranormal, include various types of extrasensory perception (such as telepathy), apparitions and deathbed visions (sometimes referred to as after-death communications or ADCs), poltergeists, experiences of persons who come close to death and survive (usually called near-death experiences or NDEs), out-of-body experiences (OBEs), and claimed memories of previous lives. Despite widespread popular interest in extraordinary experiences and paranormal phenomena, there is a paucity of careful scientific research into their occurrences and processes. Our researchers are dedicated to the use of scientific methodology in their investigation of a wide range of paranormal phenomena. DOPS is one of very few University-based research units in the world that investigates similar paranormal phenomena. Some of the other research centers are the University of Arizona, the University of Edinburgh, the University of Amsterdam, and the University of Hertfordshire in England. The researchers at the University of Virginia’s unit have a special interest in studying the evidence for survival of consciousness after death. Although members of DOPS staff have at one time or another investigated examples of many types of paranormal phenomena mentioned above (and some others not mentioned), it seemed wise to focus our efforts and resources. Therefore, in recent years the primary researchers have concentrated almost exclusively on young children who claim to remember previous lives and on near-death experiences. In studying such experiences, they have placed particular emphasis on evaluating possible explanations–normal as well as paranormal–for the experiences, by thoroughly investigating experiences reported with detailed questionnaires and (whenever possible) firsthand interviews. Through a generous donation in 2008, DOPS established a state-of-the-art EEG lab research facility, under the direction of Dr. Edward Kelly (psychologist & neuroscientist) and Dr. Ross Dunseath (electrical engineer). This facility, known as The Ray Westphal Neuroimaging Laboratory, includes an electromagnetically and acoustically shielded chamber, a high-quality commercial EEG data-acquisition system, and extensive software resources for analysis and modeling of multichannel physiological data. Within the lab setting, the researchers are studying Psychophysiological Studies of Altered States of Consciousness and Psi with the cooperation of especially gifted psi subjects. The term “psi” as used here denotes various kinds of anomalous interactions, not presently explainable in conventional scientific terms, between human individuals and physical effects in their environments. In 2016, UVA psychologist Dr. J. Kim Penberthy joined the Division of Perceptual Studies research faculty as the new Chester F. Carlson Professor of Psychiatry and Neurobehavioral Sciences. Dr. Penberthy brings with her extensive research in the area of meditation and mindfulness. She is especially interested in studying unusual and extraordinary experiences which have been reported by those individuals who may experience altered states as a result of engaging in deep meditation. in her research projects, Dr. Penberthy will be collaborating with the researchers in the Ray Westphal neuroimaging eeg laboratory to investigate the psycho-physiological correlates of altered states and extraordinary experiences. In the past, DOPS researchers conducted a large-scale survey project to identify a wide variety of spontaneous extraordinary experiences, with an emphasis on those relating to possible survival of conscious awareness after death such as apparitional experiences, and deathbed visions (visions seen by dying persons, and sometimes bystanders, at or near the moment of death). In addition to identifying cases and trying to improve the quality of evidence gathered for these phenomena, we are interested in learning more about the types of people who have such experiences and under what circumstances. If you have had an unusual experience or experiences along these lines that you would like to share with us, we would be most happy to hear about it/them. See Contacting Us for further information on how to submit an account of an experience. Many books and articles have been published based on the Division’s research. The articles produced by the DOPS researchers can be found in scientific, peer reviewed journals. The research staff regularly present papers based on their research at scientific meetings and conferences when opportunities arise. Our website includes lists of the books and articles published by the Division’s research staff including links to pdfs of the published papers.